As some of you probably know, we were lucky enough to have a room at The Sick Children's Trust House on Guilford Street while Martha Grace was in Great Ormond Street. We were there for just over two weeks after she was born, but second time around we were there for 10 weeks. It was nice to have a room which was ours, a tiny shred of privacy which was warm with a comfortable bed, a proper duvet and pillow to sleep on each night. It was a relief to have somewhere to wash and dry our clothes rather than having to traipse around London trying to find a Laundrette. 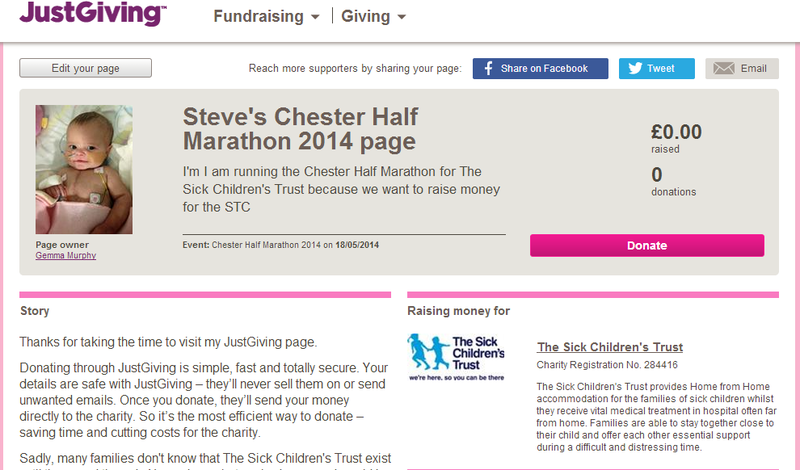 A Friend of ours, Steven Owen has very kindly volunteered himself to run the Chester Half Marathon in support of The Sick Children's Trust - the Marathon takes place on the 18th May. We would really be grateful if you could sponsor him. Mark's colleagues very kindly raised and donated an amazing £1000.00 on Children in Need day...it would be absolutely amazing if we could match - better still beat smash that total. Please visit our Just Giving page and donate however much you can spare, we really appreciate anything you can give.